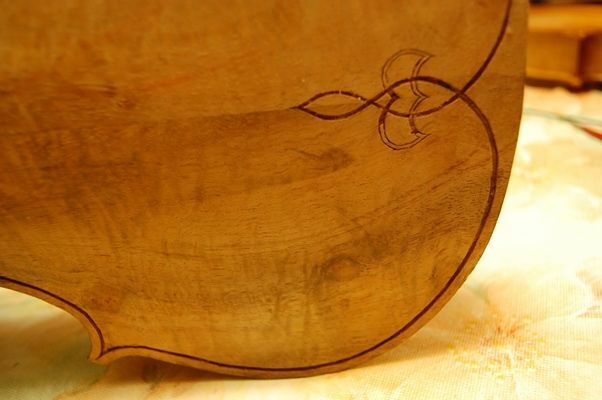 Some makers, especially those making violas da gamba, Lutes, etc., make much more complex purfling weaves. 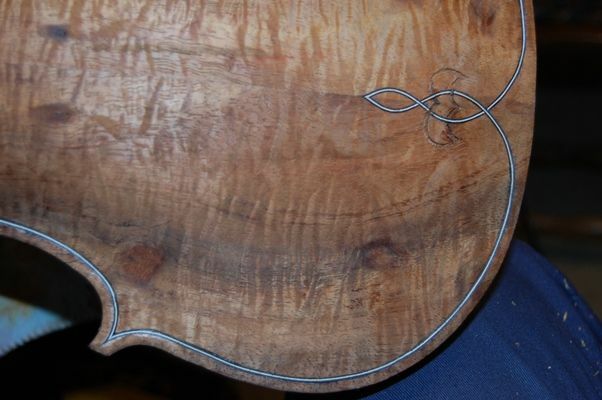 Some of the Celtic designs employ the technique in very sophisticated ways. The point is to make an illusion of 3-D “over and under” weave in the purfling. As far as I know it has zero effect on tone; just appearance. 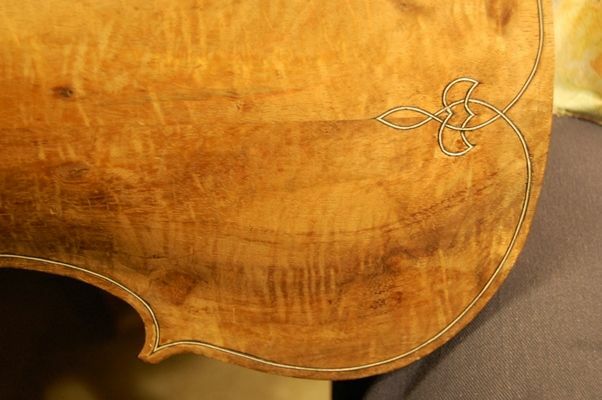 When I left off, last post, the purfling groove was nearly complete, but not quite: I finished picking out the last bits of wood in the “fleur de lis” areas, then went all the way around checking for depth and width. 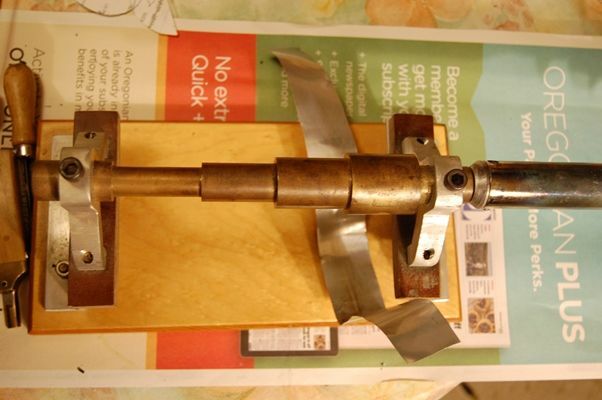 My purfling bending “iron” is an old-fashioned solder-iron affixed to a brass cylinder with various diameters. I don’t know who made it…I got it from my friend Jake Jelley. Purfling bending iron: my bending strap is spiral-cut from a large energy-drink can I found at work. Starting with the completed purfling groove, I first cut and bent the center-bout purfling strips, and inserted them into the grooves, making sure the mitered ends were all the way into the corners of the “bee-stings”, as the sharp miter-ends are commonly called. Then I cut and bent the long upper and lower bout strips, and fitted them carefully into place, jamming them tightly into the miters at the corners, and trimming them to fit exactly at the other ends. Then I began gluing the long strips in place, so that they would stay put while I installed the short ones. I tipped the center strips up and inserted hide glue in the groove, then pushed them back in place, and forced them to the bottom of the groove, so that the glue was squeezed out all the way along each strip. Then I repeated that procedure on all the upper and lower-bout purfling strips. 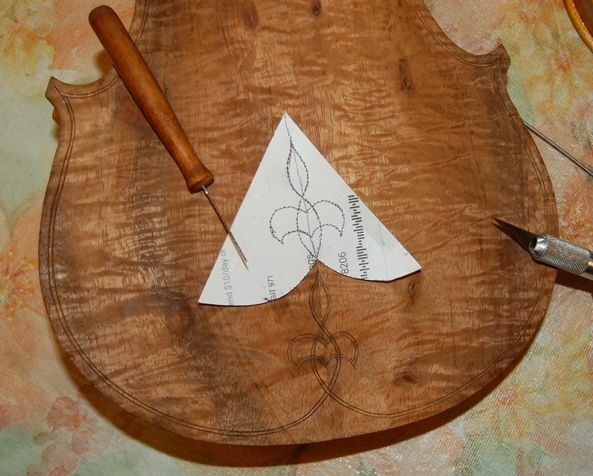 Afterward, I could begin work on the “fleur-de-lis” designs. You can see that I had to decide, initially, which strip goes “over” and which goes “under”: In reality, of course, they are all at the same level, but, choosing which gets cut off (thus looking as though it goes “under”) and which goes on through an intersection (thus appearing to go “over”) determines which way the “weave” seems to go. Once I pick a direction, I need to pay close attention to see that it continues with the “over and under” look, to make the “weave” illusion appear correctly. I also try to make both ends the same way (starting “left over right”, for instance). Purfling weave completed: next step will be to cut the channel. I used the purfling marker to lay out everything except the corners and ends, then used the template by poking through it with a needle, to lay out the ends, and sketched in the corners with a pencil and knife. Purfling layout: Upper end and corners, with template and needle. 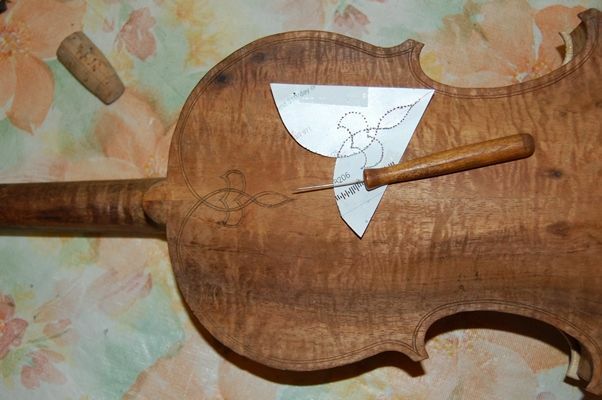 Purfling layout: Lower end and corners, with template, needle and knife. And, now I am ready to cut all my purfling grooves, pick them out, and begin installing purfling. All back purfling laid out and ready to cut. Cutting the groove and picking out the waste wood. This part is hard on the hands. 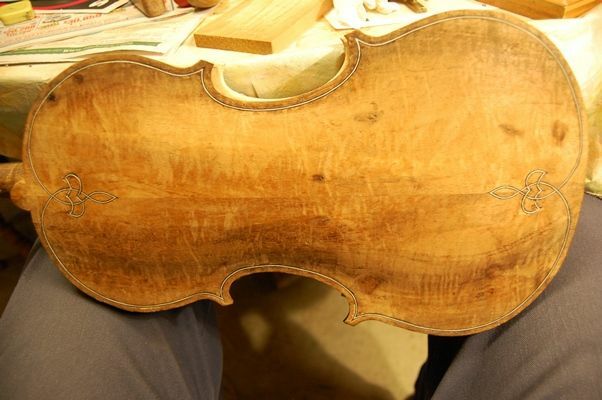 Some very good luthiers, today, now do this part using a dremel tool, but I tried it a couple of times and had some rather nasty accidents. I reverted to cutting the grooves by hand. It is hard on my hands, but I end up doing better work. I just have to take breaks now and then. 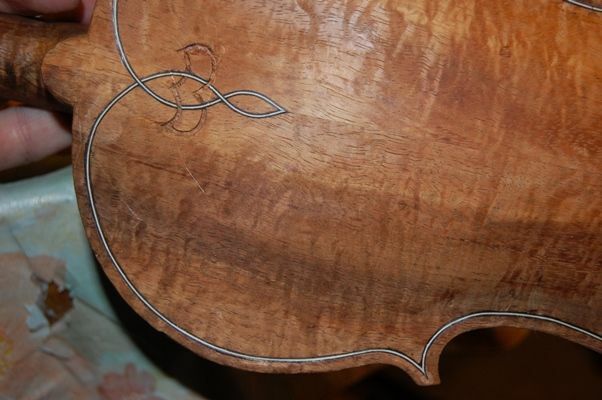 Also, inlaying the “purfling-weave” (the fleurs-de-lis) was risky, as the graduation was already complete, so I did not have lots of extra wood to work with. I had to make sure I did not cut too deeply. I worked carefully, and took my time, and got through the challenge without mishap. Aggravated my arthritis somewhat, but that is OK, too; I will just take a break for a day and do some other things. The chimney needed to be cleaned, and commercial cleaners refuse to do it, as they say our roof is so steep and high, that it is too dangerous. (sigh…) So we bought a set of chimney brushes, and, every year, we do it ourselves. That took a few hours Saturday morning. 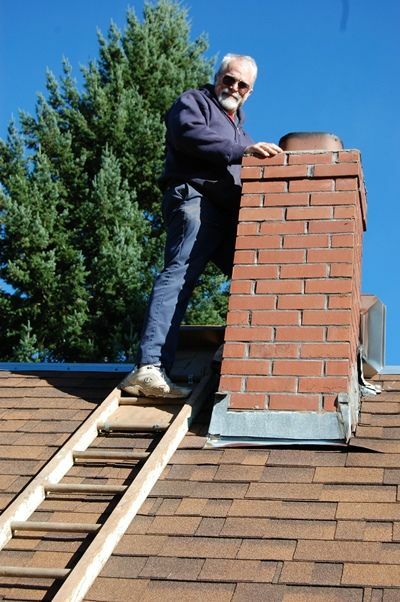 We heat with wood, and it is important to clean that chimney every year. 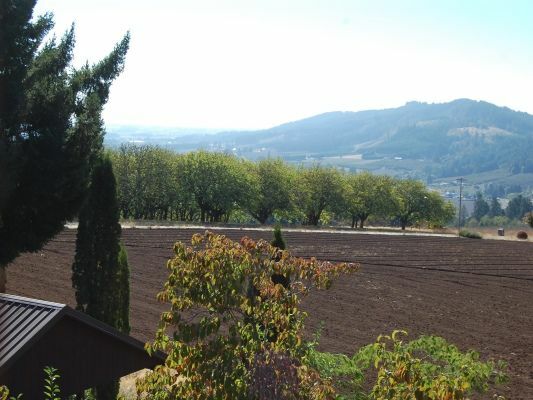 Nice view from the roof, though! 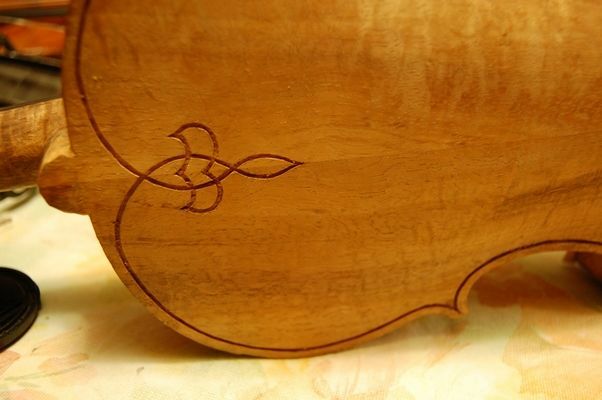 But in the afternoon and evening, I went back and got back to work on the fiddle. Section by section I sliced along those marks and cut the grooves as deep as I thought I needed them, then began picking out the wood from between the cuts. 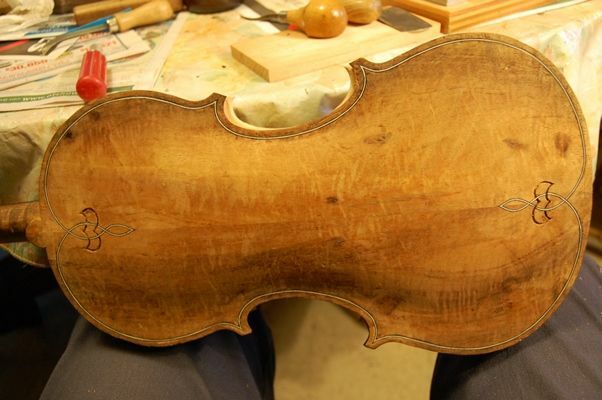 Upper purfling groove, partly cleaned and nearly ready for the purfling strips. Lower purfling groove. Ran out of energy, but this is all that was left to do. I’ll get it another day. Whole back, as it stands, now. Anyway: I think that is about as far as I am going to get, this weekend. 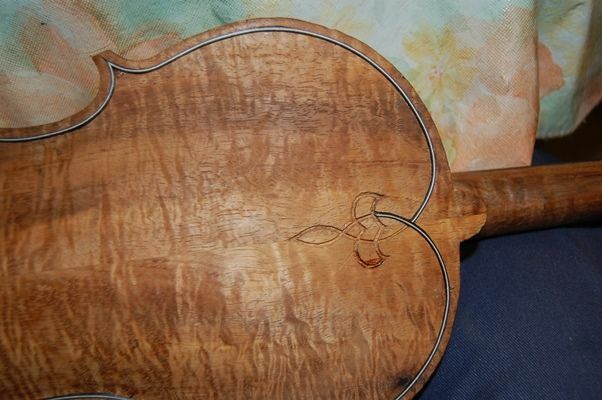 I will try to finish the purfling by Wednesday, get the heel and neck and scroll at the absolutely finished level, then start doing all the final edgework, and prepping for varnish. Life is what happens while you are making other plans, they tell me. This season has been loaded with distractions. I worked a lot of late hours at Gunderson, Inc. where I was teaching classes on Welding Supervision. Two young fellows were coming to the house a couple of times per week to work on instruments they were building. 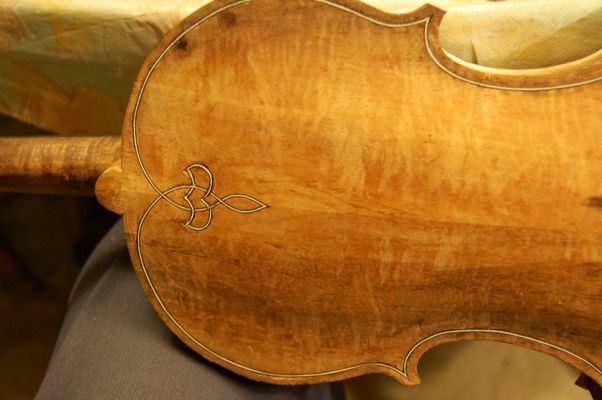 One was working from a kit, but had zero experience with tools, so it required a great deal of personal attention; the other built from scratch, and is nearly finished with a very nice 15-5/8″ viola, a fairly faithful copy of the 1580 Gasparo da Salo viola. (Funny, when those young fellows are here, I don’t get a thing done on my own work.) 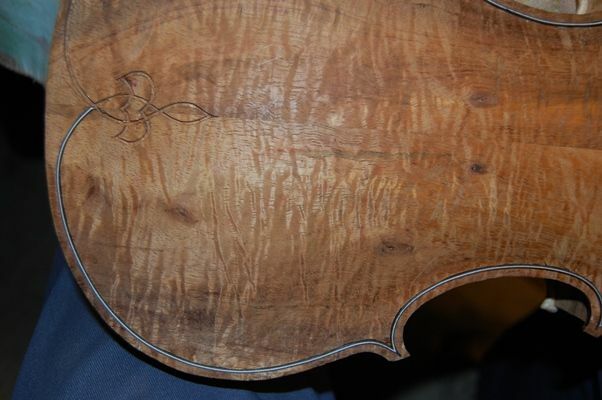 I did begin three 5-string fiddles, months ago, but have only made measurable progress on one; the Spalted Maple 5 string fiddle. I took two weeks vacation between Christmas and New Years, but ended up being sick nearly the whole time. Besides, my daughter was home from school for that two weeks, so I had reason to be distracted. 🙂 I did get a couple of work days in, but it has been a struggle. Finally, I have several repair jobs going, each of which really needs to be done, so, to make a long story slightly shorter, things haven’t turned out as planned. The maple for the one-piece back is some Oregon Big Leaf Maple that was given to me by a local landowner and forester a few years ago. 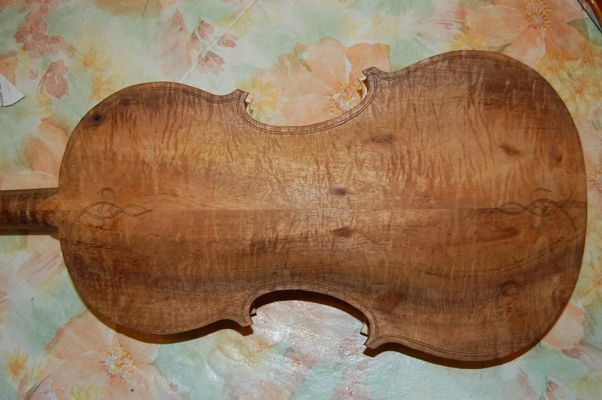 This is the third instrument I have made from that tree. 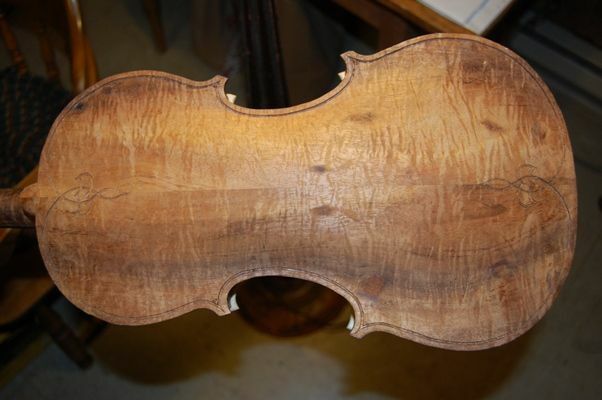 It is a relatively soft maple, and has had a very nice tone, so far, in my experience. 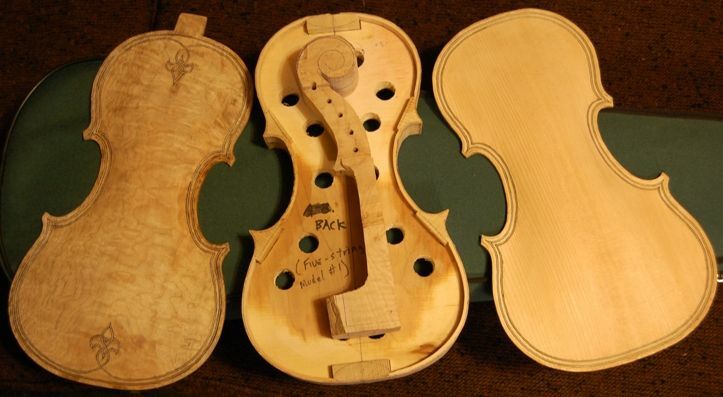 I have made one five string fiddle from it, so far, and one cello. We will see; I am feeling somewhat less than optimistic, however, after the experiences of the last three months.